Our team of car accident lawyers have extensive experience with tibial plateau fracture lawsuits against drivers, trucking companies, bus companies, and others. This is one of the most common serious injuries resulting from traffic accidents. Attorneys Fred Pritzker and Eric Hageman recently won $5.1 million for a man whose injury was so severe that his leg eventually had to be amputated. He endured multiple surgeries before his leg had to be removed below the knee. Contact Fred and Eric using the form below. 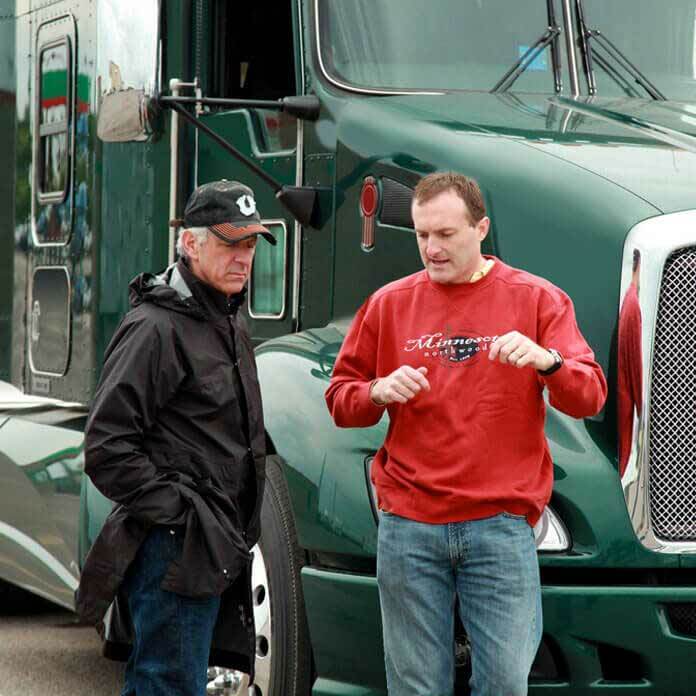 Attorneys Fred Pritzker and Eric Hageman inspect a semi-trailer after a crash caused by a commercial truck driver. The tibia (or shin bone) is the larger of the two bones in the lower leg. At the very top of the tibia is the tibial plateau. When it is broken or fractured, it can be very serious, with long-term consequences. About half of all tibial plateau fractures cause damage to the adjacent soft tissue. When the damage to the bone and/or tissue is significant, there can be long-term mobility issues, and partial or total knee replacement surgery may be required. A lawsuit should seek compensation for any expected future surgeries. When a truck or bus company is involved, their insurance representative may press you to settle quickly if you are not represented by an attorney. Many injuries like tibial plateau fractures, hip fractures, and traumatic brain injury (TBI) can get worse over time. Serious complications, such as infections, may not appear for weeks or months. Your need to get full compensation for all harm to you resulting from the crash. Tibial plateau fractures are classified by the Schatzker classification. If the driver or passenger of a vehicle involved in an accident suffers a tibial plateau injury, there can be related complications, including those discussed below. Osteoarthritis breaks down the cartilage in the knee and causes pain, swelling and reduction of motion. Because this is often a permanent disability, partial or total knee replacement may be the only treatment option that brings back at least most of the mobility. Menisci, which are pieces of cartilage that sit between the femur and tibia (thighbone and shinbone), can be torn during an accident. Treatment may require a surgeon to perform arthroscopic surgery to examine and trim damaged menisci. The medial collateral ligament is a thick tissue band that runs down the knee. This ligament keeps the knee stable. It is often damaged in an accident that causes a tibial plateau fracture. The anterior cruciate ligament in the knee can be torn, either partially or completely. Surgery is required to repair this injury. Compartment syndrome is a medical condition where there is increased pressure in one of the “compartments” surrounding leg muscles. This pressure can cause muscle and nerve damage. If this pressure is high enough, it can stop blood from flowing, which can lead to permanent disability due to the severity of the damage to the muscle and nerves. Immediate surgery is necessary to prevent permanent damage. Your tibial plateau fracture lawsuit should seek enough money to compensate you for all of your injuries, including any of the above complications. Once treatment has been decided, it is important to get therapy. Initially the therapy will consist of early range of motion (ROM) without putting any weight on the affected leg. A realistic goal is to gain 90 degrees of flexion by 4 weeks. It is vitally important to not bear weight on the affected leg for 12 weeks. Because of the long recovery period, in many cases there is significant lost income. A tibial plateau lawsuit settlement should include amounts for medical expenses and lost income. Can I Sue a Drunk Driver for Personal Injury or Wrongful Death in Minnesota? Dram Shop Liability | Can I Sue a Bar or Restaurant for a Crash Caused by a Drunk Driver?